PS - This is not an attempt to start a political debate! It is really too bad that these CEO's feel the need to insert their unwanted input into non-business political issues. Guaranteed to upset a large number of customers regardless, as people are deeply divided on the concept of gay rights versus religious liberty. Marriott's CEO is not helping Marriott by alienating either group. Agreed, he is entitled to his own personal opinion. You are also correct in saying there may be some impact on a business, particularly when new regulations may cause businesses to have to spend money to comply with such rules, but much more financial impact usually occurs when a CEO puts the corporation out there taking sides on such a divisive issue in an attempt to manipulate the debate. As stated, that kind of action can only result in some who will be more likely to support the business based on these views, and others who will no longer patronize the business when its principals choose to put the face of their own personal views on the corporation or bow to political pressure one way or the other. Cracker Barrel learned that the hard way a while back, as did Angie's List in Indiana, and now PayPal is losing a large number of customers after inserting itself into state politics. Individuals are entitled to speak for themselves, but businesses need to be businesses and stay out of political situations as this seldom turns out well. I don't think Arne was expressing his own personal opinion. He was speaking on behalf of the company, where Diversity and inclusion is listed on the website as one of the company's five core values. That is exactly the point - this is obviously his personal opinion since he chose to do an opinion piece. That is fine, but it should not be shoved on customers who may not agree, nor used to either shame or attempt to coerce the citizens of a state who do not share the same opinion. By keeping the business a business rather than a 'social justice' concern, customers are not put in the position of possibly having to make a choice about whether to do business with them or not. John_thai below makes the point precisely - manage your business and stay out of politics! And maybe it goes all the way back to the whole concept of 'core values' when those core values become highly political issues and the CEO feels the need to go out there and preach to society in general. Businesses need to stick to business and stay out of all this other non-business activity. It's fine to do business as you please within your own organization, but keep the politics and attempts at social engineering out of your public relations messages, especially when you are dealing with highly controversial issues. And yes, as you said, customers have the right to do business elsewhere, as many did with the businesses previously mentioned, but they should not have to make that decision. Most of us just get tired of all the grandstanding rhetoric and would simply prefer that these CEO's keep their opinions to themselves and carry on with business. Perhaps Arne felt that there is strength in numbers. Here's the list of the business leaders who signed the NC letter, including Hyatt, Hilton, IHG, Choice Hotels, Starwood, Kimpton, and of course Marriott. Who's left? I have heard that Mandarin Oriental has very nice hotels. **** Messinger, President and CEO, Power Curbers Inc. Yes, there is a lot of 'group think' going on at the present time, and lots of political money/pressure behind all this. It does not change the fact that it is inappropriate for business to be involved in this sort of thing. As regards lodging, I hope to be able to continue to patronize Marriott after making my point to management about the above statement and hoping it is noted. But if I wished to move on (after exhausting all the points I have built up in 17 years as a Rewards member), there are many other options out there than the companies you listed if someone feels strongly about the issue, and many people do. I have run across several very nice regional chains in my travels (none of which felt the need to sign the 'cool kids' letter), there are great vacation homes available for short term rental in many areas, and AirBnB often has good options available in many places. So I will be fine if it comes to that. Many of the signers listed above are the same ol' same ol' pushing their weight around against the majority of Americans who don't share their agendas, and they do indeed fall into that same category as Hollywood types that like to have knee jerk reactions about things they know very little about in the interest of being seen by all their friends as politically correct. Too bad most of these folks don't even seem to have read the law, which is not anywhere near the threat that they are making it out to be, but rather an effort to prevent a patchwork of confusing laws in different cities and to protect women and children, who also have rights to privacy and safety in public restrooms. As a mom, this is what matters to me from personal experience. Most of this political pressure is simply an attempt to intimidate and override the wishes of the people of a state who should have the right to decide these issues for themselves. Airbnb's CEO signed the letter, so I guess that's not going to be an option, either. If it's inappropriate for businesses to get involved in politics, how do you feel about PACs, paid lobbyists, and the Citizens United Supreme Court case? Missed AirBnB - all three of them LOL, but I feel pretty sure many of those who signed felt the need to go along to get along or be loudly and publicly condemned by their peers. Junior high school peer pressure all over again and the loudest complainers win, even when they are a small minority. There are a lot of gutless wonders out there in the world! I notice most of those signing, with the possible exception of the 'usual suspects', do not feel the need to go out and do an opinion piece or otherwise call attention to themselves beyond the obligatory signing of the letter. You see, it was not courageous to sign the letter. In truth, it would have taken great courage to stand up and disagree with the others and take the heat. What's interesting is that many of these folks are so out of touch with real people that they don't even understand how many people actually disagree with their elitist views, as they surround themselves only with those who think the same way! As regards the other entities you asked my opinion about, I don't have any love whatsoever for the political class, as I believe there is way too much money and corruption in the system. We need to return to a government that is responsive to the people it is supposed to serve rather than one where those who are supposed to represent the people become beholden to all the big money that is out there pushing agendas - which I think has been my point all along, as these businesses have wrongly joined the PACs/lobbyists/etc as the bullies out there. Let the people of the states decide their own destiny and values, and that will fix al lot of what has gone so wrong in this country! If these businesses do take their business out of the states they disagree with, it will provide great opportunities for local small business to fill the gap and thrive, so that will benefit the state in the long run and provide just as much (and better) economic activity for the state in question. Since I have a son attending Duke Med School and other relatives there, I will be visiting the state often and look for these up and coming small businesses. But I doubt Marriott or many of the others will be closing down their business there, as it will hurt them much more than it would hurt NC. I think PayPal is already finding out the cost of attempting to force its will on the state, as a lot of folks have cancelled their accounts. At least those entities you mentioned (the PACs, etc) are actually upfront that they are all about politics rather than business - as opposed to those supposed to be engaged in business who are throwing their weight around (and spending their customers' money) to try to force their views on others who don't happen to share them. I'm sure many of your above-mentioned signers are more than happy to participate in PAC's and super-PAC's and lobbyists for all their chosen causes as well. At least the PAC's are spending the money of people who actually agree with their causes. CEO's should do their politics in the political arena where politics belongs and not involve the businesses they represent in propagating their personal views. Independent Expenditures: While companies are permitted by law to engage in independent expenditures or electioneering communications to advocate for the election or defeat of federal candidates, Marriott International has chosen not to engage directly in such activity at this time. State & Local Contributions: Where permitted by law, Marriott may contribute directly to state and local candidates, state party committees, and other state and local political entities. All such Marriott contributions must be approved in advance by Marriott International’s Government Affairs Office. Marriott International will semiannually disclose on its website all Company state and local-level political contributions and expenditures that exceed $100. 527 Committees: When permitted by law, Marriot may contribute to 527 political committees. Such contributions must be approved in advance by Marriott International’s Government Affairs Office. Marriott International will semiannually disclose on its website all Company political contributions and expenditures that exceed $1,000. Federal law does not permit corporations to contribute their own funds to federal candidates, political parties, or most other political committees. U.S. law does permit companies to establish a political action committee to collect employee donations to contribute to federal candidates and other committees regulated by the Federal Election Commission (FEC). The Company has created the Marriott International Political Action Committee (MARPAC) for this purpose. Contributions to federal candidates and committees are made only through MARPAC, in accordance with FEC regulations. To provide funding for MARPAC, the Company periodically solicits voluntary contributions from eligible employees. The Company fully discloses all MARPAC activity on reports filed with the Federal Election Commission (FEC), which are publicly available on the FEC website. For any trade association of which Marriott is a member or otherwise contributes, Marriott will disclose the portion of Marriott International’s payments that are used for lobbying and political expenditures as defined by 26 U.S.C. Section 162(e). Marriott International will semiannually disclose on its website any amounts reported in response to such requests. Marriott has internal policies governing political contributions, lobbying, and personal political activities, and enforces compliance through its internal legal and government affairs departments. The Board of Directors reviews these policies and practices regarding political contributions and expenditures by the Company and its PAC semiannually. Marriott’s culture encourages individual participation by employees in the political and governmental process. Yes and thank you for making my point yet again. The CEO is entitled to his personal opinion but the BUSINESS should not be involved in any way. And the Marriott family likely does have different opinions but they are not projecting them on to the BUSINESS. They are not broadcasting them to the world. I appreciate the civil debate on the topic and it all comes down to the point I have been making from the very beginning of this - individuals need to speak for themselves only and keep the BUSINESS out of it. To put your company in the middle of a controversial issue - even when you believe you are on the more 'trendy' side of the dispute - is not good business and will cause you to lose more than you gain in most cases. And using your business to bully citizens/customers to agree with your point of view (OR ELSE) is likely to backfire on you in the long run. That is your opinion, which you have shared repeatedly here. Others opine differently. And just how on earth is anyone being bullied? Excellent work and excellent post, clebert. This perfectly illustrates the importance of political involvement towards good business success. I'm impressed with your tenacity in the face of a debate with some, whose investment in a previously established opinion is perhaps too great to be swayed. Great job. pluto77, thank you. I really didn't intend to start a political debate or take sides. I just find it fascinating to see how the hospitality and travel industry responds to current events and how these big companies run their businesses. I think a lot of people perceive Marriott International as being politically aligned with the Marriott family's politics which seem to be completely opposite of Arne Sorenson's politics. But the fact that Bill Jr. put Arne in charge tells me that these folks are interested in diverse views, political or otherwise. I think it's smart business sense to associate yourself with people who are different than you. It keeps things fresh and balanced. And it is interesting to see how Marriott plays both sides of the political fence which seems to indicate that they truly are primarily interested in business, not politics. Politics seems to be a necessary part of business, and business seems to be a necessary part of politics. They are intertwined, for better or for worse. I know you didn't. "Politics seems to be a necessary part of business, and business seems to be a necessary part of politics. They are intertwined, for better or for worse." You nailed it. This may or may not be politics! Only Arne and some who are close to him know the answer. For some this is the politically correct thing to say. However, in their hearts, many believe that LGBTs are often abused by society and that their rights must be protected. To some others, this is an example of their own rights being trampled upon. They envision an embarrassing moment when some one, whom they regard as a different gender, being next to them at a rather private moment. Some of them even fear that sexual predators may use this situation to act in a deviant way. I assume that Arne feels that the NC law is intended to mistreat LGBT people and, if so, he has the right to say so. Since the law is contrary to the tolerance policies of Marriott International his remarks are completely appropriate. Do we really want to get involved in a controversial social topic like this here. Go to Flyer Talk OMNI PR and see what happens. Let's talk about hotels. Good answer, john_thai! Speaking of South Pacific, our first foray into that realm will be Fiji, not Bora Bora, primarily because Fiji Airways has some very reasonable business class fares from LAX. Starwood has a Westin and a Sheraton there, but no Marriotts! But I do have Bora Bora and Tahiti on the bucket list, and maybe even Cook Islands or American Samoa. So many places, so little time and money. I agree with you, phctourist, it has everything to do with business, and more specifically, good business. The bottom line in opposing NC's HB2 bill, and the reason for the public stance (of not just Arne, but the entire group of business leaders) is strictly about doing what's good for business (my take). The number one priority of any CEO is to do what's good for business by stimulating growth, investment and innovation. Sometimes, government can get in the way of that. I think (again, my opinion) this creates positive economic activity more than not. In this, I think he's doing his job. Agreed. Further, I care about a CEO's political opinions about the same as I care about a Hollywood actor's opinions. Manage your business and stay out of politics. Oops. I appear to have started the aforementioned unwanted (at least by me) political debate, and I have wandered into the muck. And of course Mitt Romney currently sits on the Marriott board and has done so for many years. The Marriott brothers have spent a bit of that fortune on politics. Not only did they donate $1.5 million to Restore Our Future, they've also given to congressional campaigns. Most but not all of their contributions have gone to Republicans. The company's political action committee has also been active. Bill Marriott talks to students at the Marriott School of Management on the Campus of Brigham Young University in Provo, Utah, on Tuesday. The school was celebrating his 80th birthday. "It was never for anything related to a particular party. It was more of a focus on what would be best for the lodging industry and what would be best for the tourism industry," says Beck, who says Marriott employees were encouraged to give to candidates with an eye toward helping the company. 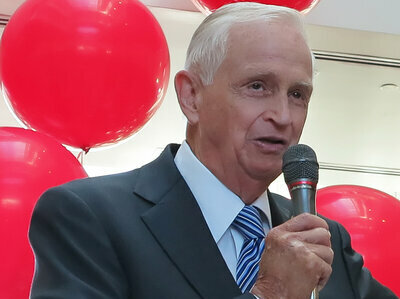 The one issue on which Bill Marriott has been publicly outspoken is immigration reform, perhaps not surprising given that he led a company that employs thousands in low-wage service jobs, many performed by immigrants. "It's impossible to send 12 million undocumented immigrants home. We really need to cool the rhetoric and work together to come up with a federal solution — one that creates a workable verification system so that we employers know who we're hiring," Bill Marriott said at the National Press Club in 2008. And again, I did not say the Marriott family was not active in politics. Obviously, the Marriott family is doing it on an individual basis, but they are not taking a stand on behalf of the BUSINESS, because if that were true the business might be taking a different approach in this current situation. As you say, they encourage INDIVIDUAL political participation. It is when the business itself gets 'intertwined' in things and a principal throws the weight of said business around that he/she is in the wrong. Perhaps you should consider what your response would be if Marriott were to take the opposite side of this issue instead of celebrating because the business has been used as a club in a controversy where you happen to agree with them. Bottom line: Businesses are not social agencies and should not be used as such. I disagree. A business can be whatever it wants to be, so long as it's not breaking any laws. Last time I checked, we still live in a free country. fhsbbmom, if Marriott had taken the opposite side of this issue, I would have posted a link to Arne's comments with the heading "Arne has spoken!" I thought that other Insiders would be interested in reading about Arne, no matter what the topic. I think he is an interesting guy, and I think the same about Bill Jr. I guess I'm just a hospitality geek. Once I stayed up half the night at a Conrad property reading Conrad Hilton's bio which I found in the nightstand when I was looking for the Book of Mormon (forgot I wasn't in a Marriott!). It was fascinating. I admire these industry leaders for their business acumen, and am interested in hearing what they have to say. The only thing I'm celebrating is the SPG merger and the opportunity for us MR people to use our points at the St. Regis Bora Bora - woo hoo! Finally, Marriott will have a presence in the South Pacific! Well, I will just have to take your word on that. Again, I appreciate the civility of the discussion, that we can agree to disagree on traditional business concerns versus businesses with social agendas using those businesses to try to disenfranchise the people of a state. It gets tiresome and it was disappointing to find that Marriott took a lead on it due to a CEO with an agenda. Safe travels and enjoy the South Pacific - I doubt I will ever get that far from the good old USA! At least not until all the kids finish college and I can retire. Me.....I'm not advocating for or against a partisan political party, candidate for partisan political office, or partisan political group. It's just a picture from 2012 of the dog. Dog....Yeah, Its a picture of me in front of a past republican running for office isn't it? Me....I'm not expressing support or opposition to partisan political candidates or activity. Dog....I think I peed on that sign. Me....Nope!, sorry you didn't, that might violate the Hatch Act. It's just a sign that you just "happen" to be standing by that I took a picture of. Dog....Its good to be me!, but wasn't there a story about Romney strapping the family dog on top of the car when he went on vacation? Maybe that's what I was thinking when I peed on the sign. Me....You did not pee on the sign! I recall a story of Obama eating dog meat when he was a boy. What do you think about that? Dog...I've got no worries that I'm worried about. Me...Good! We're visiting the White House in June. wesleywc, you win the debate (not that there actually was one) - good stuff!